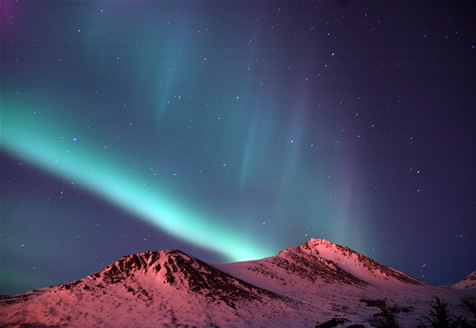 What causes the Northern Lights/Aurora Borealis ? The sun gives off high-energy charged particles (also called ions) that travel out into space at speeds of 300 to 1200 kilometres per second. A cloud of such particles is called a plasma. The stream of plasma coming from the sun is known as the solar wind. As the solar wind interacts with the edge of the earth's magnetic field, some of the particles are trapped by it and they follow the lines of magnetic force down into the ionosphere, the section of the earth's atmosphere that extends from about 60 to 600 kilometres above the earth's surface. When the particles collide with the gases in the ionosphere they start to glow, producing the spectacle that we know as the auroras, northern and southern. The array of colours consists of red, green, blue and violet.